Everyday around 150,000 vehicles travel on a Bronx bridge that was built in 1932 and that may be about to collapse. The bridge which is the connector carrying the northbound lanes of the Major Deegan Expressway over an abandoned subway track is the oldest bridge listed in the top 10 most traveled structurally deficient bridges in the State in a new report by the American Road and Transportation Builders . 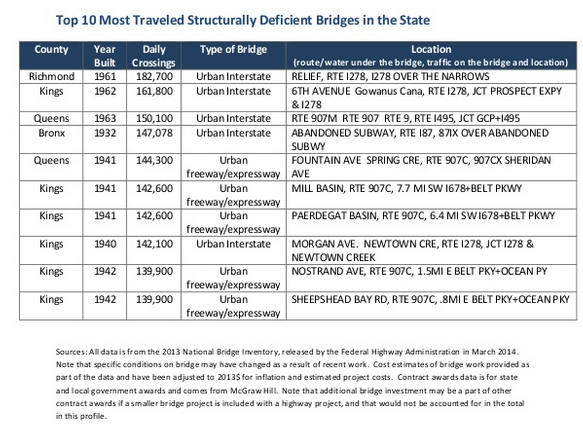 The 9 other listed bridges are all in New York City: 1 is in Staten Island, six are in Brooklyn and two in Queens.